2016 gift guide #1 :: stocking stuffers! Hey guys! I scheduled this post to come up on December 1st… so happy December! I LOVE December. It’s one of my favorite months. Obviously because of the holidays and the snow (sometimes), but I also love knowing that the new year is right around the corner! I’m so looking forward to 2017. 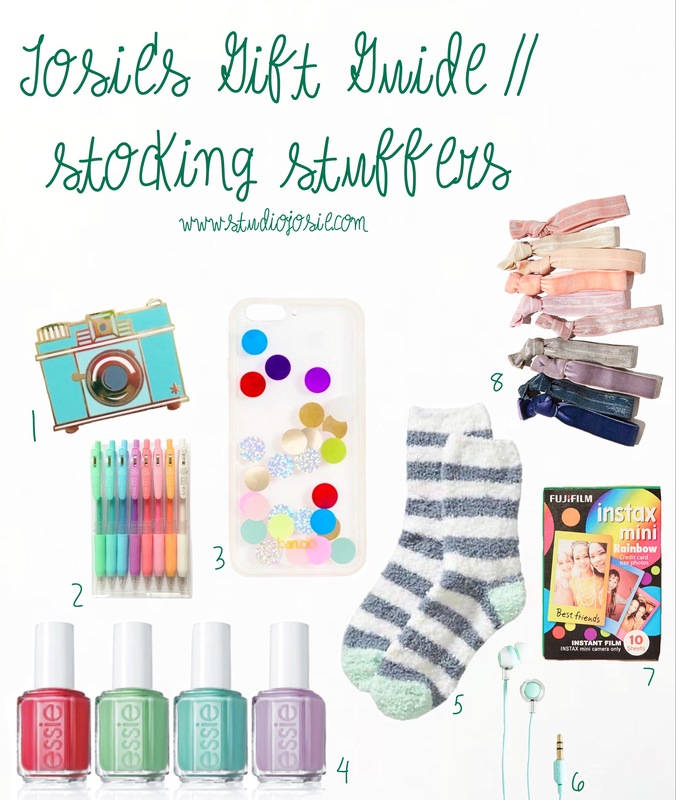 Today I am going to start a mini series called Josie’s Gift Guides! I love giving gifts and I thought I’d give you all some fun ideas! 1 // Camera enamel pin // Enamel pins are so fun and so cute! This is a really great gift because there are HUNDREDS on etsy you can choose from to match personalities! 2 // Gel pens // Who doesn’t love a new set of pens? Especially with the new year coming up, there are so many opportunities to use them and write in a journal or draw! 3 // Phone case // This one is from ban.do, and I LOVE ban.do so so much! Their products are so original and colorful. I have a planner from them and it’s just the best! 4 // Nail polish // I’ll admit – I can’t keep nail polish on more than few days because I will pick it off, BUT with fun colors like this, I would try to keep it on for weeks! 🙂 Essie is my favorite brand. 5 // Fuzzy socks // Do I even need to explain why these are amazing? I don’t know anyone who has turned down a pair of fuzzy socks! 6 // Earbuds // If you’re anything like me and always loose your earbuds, a new pair is always great! 7 // Rainbow Polaroid film // For Polaroid lovers, this is a super awesome little gift! 8 // Hair ties // These are a bit fancy, but I love getting any hair ties cause I ALWAYS need them! Haha! Hope you guys liked this! Stay tuned for MORE! Yay! Happy December! Next Next post: photos from my thanksgiving!